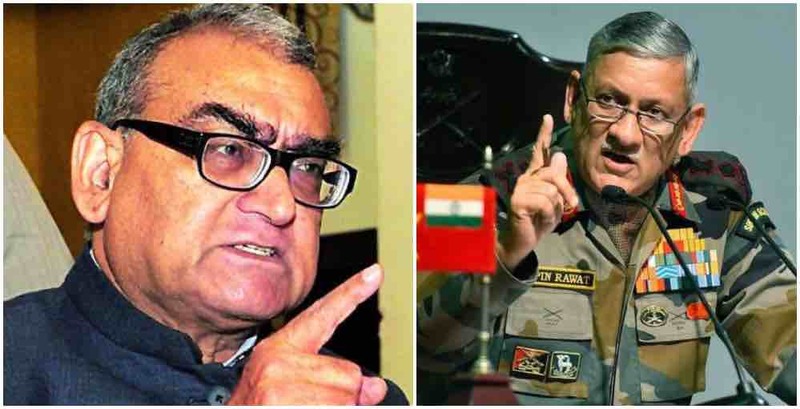 Srinagar: Former Supreme Court Justice, Markandey Katju, who has also been the chairman of the Press Council of India, has criticised the Indian Army Chief, for the massacre of civilians in the Pulwama region of Kashmir. “Congratulations to Gen Rawat whose soldiers killed 7 civilians in a Jallianwalabagh or My Lai type massacre in Pulwama, Kashmir. How brave of the Indian army General,” Katju wrote satirically on twitter. Three cheers for the Indian army which has now started killing civilians in Kashmir, like Gen Dyer at Jalianwala bagh or Lt Calley at My Lai in Vietnam. All Indian army officers and soldiers should be given Bharat Ratna. Earlier, Former cricketer and heartthrob, Shahid Afridi had said that he supports his Prime Minister Imran Khan and “Kashmiris must get to decide their future”. “I totally support Imran Bhai! I have always maintained the same. Justice must be delivered, Kashmiris must get to decide their future,” Afridi wrote on his Twitter, in reaction to Khan’s earlier tweets. Condemning the killing, Prime Minster of Pakistan had said that ‘only dialogue, and not violence and killings, will resolve this conflict’. Seven civilians were killed after armed forces opened fire on protesters near the site of a gunfight in Kharpora Sarnoo village of Pulwama district on Saturday. Three militants and an army man were killed in the gunfight. The Indian army on Sunday asked people to avoid the march towards 15 corps headquarters situated at Badami Bagh Cantonment in Srinagar over call given by the Joint Resistance Leadership (JRL). National Conference Vice President Omar Abdullah while reacting on the Pulwama civilian killings said that it is a massacre and there is no other way to describe it. Earlier, Abdullah while reacting to the civilian killings had said that it was ‘another blood soaked weekend in Kashmir’. PDP President Mehbooba Mufti while reacting to the civilian killings has said that there would be no probe which would bring back the dead. She also asked that ‘is this what was expected from the Governor rule’? She also said that no country can win a war by killing its own people. Police, in their statement said that they were ‘deeply grieved’ by the loss of civilian lives however claimed that the crowd came ‘dangerously close’ to the gunfight site. or WORD CIVILIAN must be refined. How one wishes Katju is taken to the site of the next operation. Then and then alone he should pass comments on the actions of brave hearts. Few comments means few eye-balls for ads. I feel so disgusted by this comparison by a person who uses his past position of Chief Justice, to criticize RAmy. He should live among these Intifada copy cat Stone Pelters. The gentrlem is too senile and ignorant to think straight.